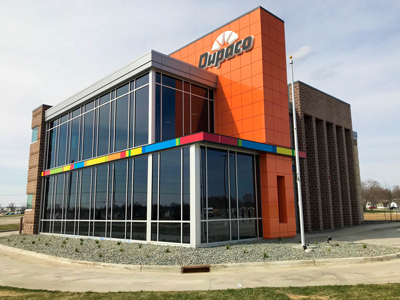 Dupaco Community Credit Union has opened its full-service learning lab branch at 5970 Carlson Way as part of a new development near the intersection of Highways 151 and 13 in Marion. Construction of the two-story, 7,140 square foot branch began in August 2017. The new building is among the first as part of a new, 20-acre mixed-use development called Squaw Creek Crossing, which is situated on the northeast side of the intersection. A golf driving range previously occupied the site. Full-service Dupaco branches are primarily designed to help members understand money and improve their financial positions. Some back-office support employees also will occupy the space. The learning lab branch focuses on teaching members how to control their money through hands-on demonstration of Dupaco desktop, tablet, and mobile deposit services, and more. The branch also features a service delivery technology called an interactive video teller, which allows live tellers to conduct real-time, face-to-face video transactions from a distance. Dupaco employees located at a central location in Dubuque remotely operate the Marion lobby and drive-through video teller machines. 5970 Carlson Way in Marion. Resources from a former Dupaco office at 501 4th Ave SE in Cedar Rapids were transition to the new Marion office and a live video teller outlet inside the NewBo City Market.